It’s not exactly family movie night material, but episodes of Wild Kratts—a half-animated, half-live nature show featuring the brothers who gave us Zoboomafoo—will entertain and inform children ages 3-8. 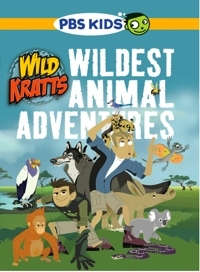 Chris and Martin Kratt’s series, which airs on PBS KIDS GO, is a hybrid that combines the brothers’ nature show activities with a cartoon segment that feels like a cross between The Magic School Bus and a Disney animated series like Kim Possible or Phineas and Ferb. Watching The Many Adventures of Winnie the Pooh is kind of like riding on “It’s a Small World” at Disney’s Magic Kingdom. It’s a ride obviously designed for families with small children, but many adults seem to enjoy it as well. However, if you position yourself atop the bridge and watch the little boats return, you’ll see by the faces of the older children that they’re reluctant passengers. 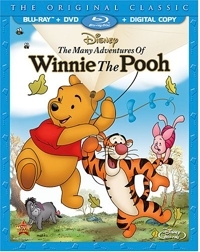 So it will be with The Many Adventures of Winnie the Pooh. 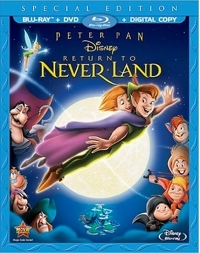 Return to Never Land played in theaters in 2002 rather than going direct-to-video—an indication that Disney thought more highly of this sequel than some of their others. But it’s so similar in structure that if you’ve recently seen the original 1953 animated Peter Pan, you may wonder why this film was even made. Instead of Wendy being the skeptic, it’s her teenage daughter, Jane, who finds Mother’s stories of Never Land juvenile and utterly inappropriate, given historical events. It’s around 1940, the men have gone off to war, and the young children are being shipped to the country to protect England’s investment in the future. Jane’s siblings are already out of the picture when she is swept away to Never Land, where she discovers it’s all real and learns a lesson about belief. The plot of Epic will strike older family members as yet another mythic kingdom structure, where a world (like Narnia, for example) is dependent upon the balance between good and evil, or at least evil being kept in check. When evil surges and suddenly poses a more urgent threat to the future of all life, hope lies in a chosen one or a youngling or budding new emblem of goodness that needs to be protected until such time as the Good One can assume his/her/its rightful position, and balance (or at least the illusion of it) can be restored. After her mother passes away, teen Mary-Kate (Amanda Seyfried) comes to live with her eccentric and estranged father, Prof. Bomba (Jason Sudeikis), whose singleminded drive to prove the existence of miniature forest warriors created a distance between him and his family. But after M.K., as she prefers to be called, is magically miniaturized, she learns her father was right all along—that the Leaf Men he sought really do exist, and they ride hummingbirds as they battle the forces of evil in a forest nearby the professor’s Victorian house. 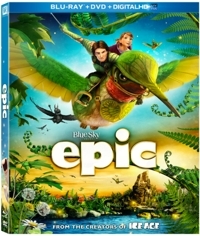 Epic was inspired by a children’s book intended for ages 3-8—The Leaf Men and the Brave Good Bugs, by William Joyce—but many scenes also evoke Honey, I Shrunk the Kids. The plot is just good enough to get by, and the energy level and forward movement are sufficient to hold even the most easily distracted child’s attention. But the film’s chief strength lies in its depiction of a new and exotic world and appreciating how Fox animators envisioned and created such a world. Standing Up is D.J. Caruso’s film adaptation of The Goats, a popular juvenile novel by Brock Cole that’s been among the 100 Most Frequently Challenged Books, according to the American Library Association. I can see why. 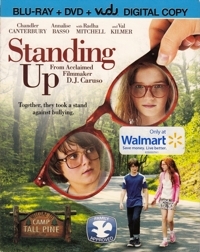 Standing Up tells the story of a cruel tradition at a summer camp that has boys luring the weakest among them to an island, then stripping him naked and leaving him there for a while. The girls at camp do the same thing to one of their own—or rather, the one who fits in the least. Marooned most often are the geeks, the nerds, the misfits, the kids who would be made fun, bullied, or shunned during the school year by a different group of insensitive “cool” kids. Camp counselors look the other way so this “tradition” can continue, but this year’s “goats” feel so humiliated and hurt by their experience that they go on the run instead of waiting to be picked up again and taken back to camp. “Standing up” implies standing up to bullies, which is a brave but not always healthy thing to do. Running is more practical, but not terribly empowering. Also, there’s a single incident when the pre-teen boy comes to the rescue of his companion, yet that involves a blindsided leg sweep like the bad guys did to The Karate Kid. It’s not terribly noble, and in fact strikes me as something a bully might do. There are so many adaptations of Charles Dickens’ A Christmas Carol that it’s hard to keep track of them. In the world of animation and family programming we’ve seen versions featuring the likes of The Smurfs, Mister Magoo, and The Flintstones. But none of them were as successful as Disney’s adaptation featuring Mickey Mouse as Bob Cratchit and Scrooge McDuck as Ebenezer Scrooge. The good news, for HD fans, is that you won’t have to go another holiday watching the movie on DVD. 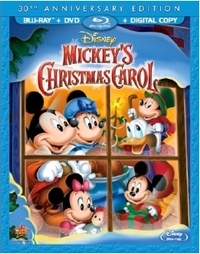 Disney is releasing a 30th Anniversary Edition Blu-ray combo pack of Mickey’s Christmas Carol on November 5, 2013. 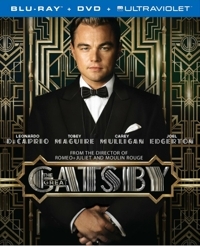 If your children are of high school age, Baz Luhrmann’s version of The Great Gatsby is a worthwhile film to watch together. Certainly it’s superior to the dreadfully slow-paced 1974 adaptation. But it helps if you’ve read the F. Scott Fitzgerald novel first, as many do in high school. Then the fun comes from comparing (and talking about) the ways you’ve imagined scenes versus the ways in which Luhrmann depicts (or deconstructs) them.